The 14 stories of The Dogs of Detroit each focus on grief and its many strange permutations. This grief alternately devolves into violence, silence, solitude, and utter isolation. In some cases, grief drives the stories as a strong, reactionary force, and yet in other stories, that grief evolves quietly over long stretches of time. Many of the stories also use grief as a prism to explore the beguiling bonds within families. The stories span a variety of geographies, both urban and rural, often considering collisions between the two. Brad Felver is a fiction writer, essayist, and teacher of writing. His fiction has appeared widely in magazines such as One Story, Colorado Review, and Midwestern Gothic. His essays have appeared in New England Review, Hunger Mountain, BULL: Men’s Fiction, and Fiction Writer’s Review among other places. His awards include a Pushcart Prize Special Mention , the Zone 3 Fiction Prize, and most recently the 2018 Drue Heinz Literature Prize. 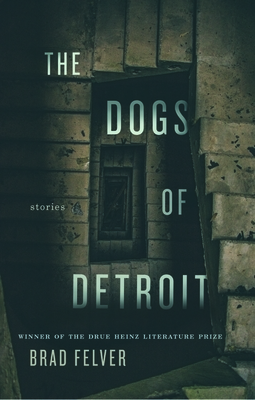 The Dogs of Detroit is his first story collection. He lives with his wife and kids in northern Ohio. Such commitment and bravery on the page are vital to this moment in our region's history, when the calls for a deep reckoning with out troubled legacy have met a dangerous level of entrenchment. With I Can't Talk About the Trees Without the Blood, Clark emerges as a necessary voice from the contemporary South. "In this accomplished debut, Felver delivers a powerful, haunting sense of life’s hard contours in clear-eyed language that never stoops to gratuitous violence or self-­conscious drama. “We were mean kids. We knew it and celebrated it,” says one story, while another effectively encompasses a couple’s dating to post-divorce relationship in under 25 pages." "Felver has created a dark mirror for readers to gaze into."